Ok, the road trip is over and we finished up 4-3. Seems we lost some steam after that 9 game winning streak, so it’s time to re-stroke the boiler and take it up a notch for this 5 game home stand. I like our position on re-gaining the lead over the next week. The Firebirds are in for the first 2 nights, and they’ve been roosting up north for 3 days without playing because of rain. We’re warmed up, so let’s take them down and build momentum for the 3 games that follow. Yea, the Pirates will be next on the agenda. These 3 games with them are our golden chance to power ourselves back into the lead. The Pirates are playing great ball and they’ll be in the dog pound with the Greyhounds for 2 nights before coming to us. We know the Dogs are playing touch and close ball. It won’t surprise me if they chew a little off the Bucs before sending them our way. Our history with the Pirates this season is 2-3 with 5 more to go. We dropped 3 straight our first road trip there and the following trip there we took the next 2. I believe they were a better team the second time we faced them and I know the Railroaders were. Tradewater has added a couple of new guys (pitching I believe) and their stats are showing the improvement. And on the other hand, the Railroaders have continually proved they can overpower any team. The next and final road trip for the Railroaders will see them in Owensboro for 3 and Marion for 3. The Oilers continue to slide along closely behind use. We’re in the spot now to take control and win the pennant race. Time to get back to work. There are 18 games left and next 11 could very well decide the race. Let’s get all the Fans out and pick up the players for the most exciting time of the season yet. I really don’t enjoy going to the Dog Pound for baseball. 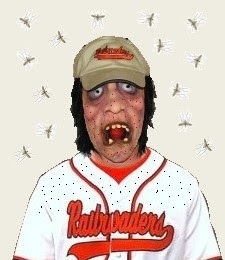 Between the mosquitoes and fleas, along with the yelping mongrels, it’s hard to enjoy the game in such conditions. I like it even worse when we lose to Hounds. But one more game to go there, and we’re through playing ball in Union City for the season. So let’s take this second game on Friday and the next time we face the Hounds it will be in our Yard where the pests won’t be around to bother us. We’ll be ready then to head home for some Bird hunting on Saturday and Sunday with Farmington. It’s time to really gear it up our play too, the Pirates are sailing our way for 3 games next week. On Monday, Tuesday, and Wednesday, some of the most important games of the season will be happening in Fulton. We’ve taken the Bucs twice this year, but they’ve improved their pitching by going out and fielding a few new guys. They’ve been hot lately and just slightly ahead of the Railroaders. The lead in the standing will be on the line and we need to be ready for them. Let win these next three nights to fine tune our game and blast the Bucs out of position. Well the loss to the Oilers spoiled our 9 game winning streak , but the record on this road trip thus far of 4-1 is not bad, not bad at all. 2 more game, both at the pound in Union City, will complete this trip so there are still wins to be had. And yes, the ole’ Pirates won again and take a half game lead in the standings. But we’ll face them next Monday on our turf for the start of a 3 game series for what’s sure to be an exciting time at the Yard. And don’t forget, we have the Firebirds in town too this Saturday and Sunday night. We won’t get to test our skills playing against the Chicago Wildcats on Wednesday, not sure why they couldn’t make it. Maybe they heard how good the Railroaders are playing and decided not to bother. In any case, a day off for the guys is a good thing as the road trip draws near to an end. Let's get ready for some intense ball playing over the next 2 weeks. We are still positioned to make great run for the pennant. We need to get all the Fans out for these upcoming games and help fire up the engine! If you can't remember, or you're too young to know, here's a bit of Kitty League baseball history with the Railroaders. In 1951, The Railroaders won Fulton their first Kitty League pennant. Fulton went on to win the pennant for the next two years, a feat never before accomplished in the 50 year history of the League. The Kitty folded in 1955, before being revived again 50 years later to the present day KIT League. 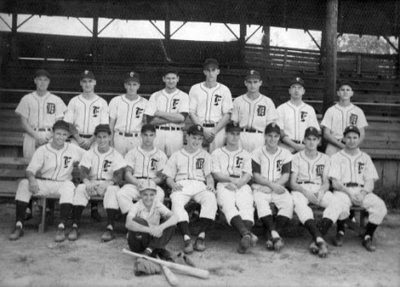 The Fulton Railroaders won the first pennant in 1951, and in 1952 and 1953 the team played under a different name. What name did Fulton's team use thru 1955? Do you know any other names the team used during it's history with the Kitty League? What was the name of the ball field in Fulton at that time? Post your answers here on this blog entry. The Train is rolling down the tracks now! I couldn't go to Owensboro or Farmington for that matter, cause I'm still working on cleaning up the Yard for Wednesday. 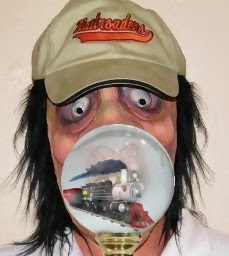 But I plugged in the ole' crystal ball and have watched the Railroaders steam their way to victory after victory. That's 9 straight wins so far and looking like no end in sight. One more game with the Oilers before they're home briefly on Wednesday to play an exhibition game with Chicago Wildcats. Then off to Union City on Thursday and Friday to take on the Dogs for 2 games. Then the Firebirds come to town for the weekend with 2 games. Monday of next week sees the Pirates heading our way for 3 nights of hot baseball action at the Yard. We'll be ready for them, too. 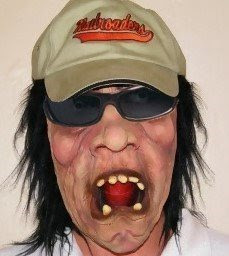 I'm getting my pirate spy gear out soon, and will infiltrate their ranks and spoil their plans to take first from us. Keep the pressure up, boys. Full steam ahead!